The year quickly coming to a close. We wanted to take the time to share some updates to shop floor software and hardware that you all need to see for 2017. Whether you implemented them into your manufacturing routine or you are looking for new tech for 2017, here is what you need to know. Obtain the goals of lean manufacturing, continuous improvement, and turning data into actionable items. 1 – Scytec DataXchange Machine Monitoring & Data Collection – Many shop floor runners are fans of DataXchange for their $45 per month, per machine Cloud pricing. They may also want to check out Version 2016.10.03 updates. New features include an MTConnect Data Viewer, which is a testament to DataXchange’s continuing advocacy of the protocol. Scytec Support staff will also be able to remotely restart DataXchange for users without remote access, as well as many utilization tools being updated or refreshed. You can also integrate DataXchange with Bigfoot CMMS from Smartware Group if you are seeking a plant maintenance management system, which you can read more about here. 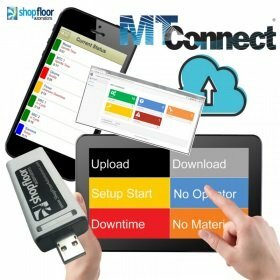 2 – The WiFi USB Connect – This new piece of hardware is a wireless USB solution for the manufacturing shop floor. It emulates a USB stick, allowing you to share data from a PC to your machines. No drivers are required, plus Floppy drive emulators and CNC machines with a USB port can now have wireless abilities! The device serves as an easy and economic shop floor upgrade, with more info here from MoldMaking Technology. 3 – Machine Monitoring through Predator MDC – With v11 now available, there are many incredible new updates and quite a few improved features. All the changes will be beneficial to your shop floor. Enjoy accessing MDC machine monitoring on Android phones, a real-time view of data from any browser, many new charts to display information on, and an updated list of Windows Support. 4 – MTConnect & the Cloud – More CNC machine controls, and more shop floors are embracing MTConnect. The open, royalty free factory floor communication standard is universal and embraced by shop floor factories. Industrial Machinery Digest published a piece about integrating MTConnect, along with machine monitoring, at this link. 5- Predator’s Touch HMI – A big button interface, Predator’s Touch HMI replaces bar code readers, handheld terminals and proprietary shopfloor hardware. It simplifies data collection on machine uptime and enables access to information via tablet, PC or CNC. Buttons can transfer NC programs or launch the part drawing on the shop floor for the operator. It can also be color-coded for the convenience of individual machinists. More on Touch HMI via a Modern Machine Shop piece you can read here. Want to become the hero of your shop floor by helping achieve better machine utilization? Call us at (877) 611-5825 or chat with us on social media. Check out any of the products mentioned in our store, or contact us for info on MTConnect & Cloud options.